So the MLBPA is blaming the media on this one? I love calling out the Main Stream Media on stuff they do, but this one is on deGrom, Cespedes, and Syndergaard’s agent. 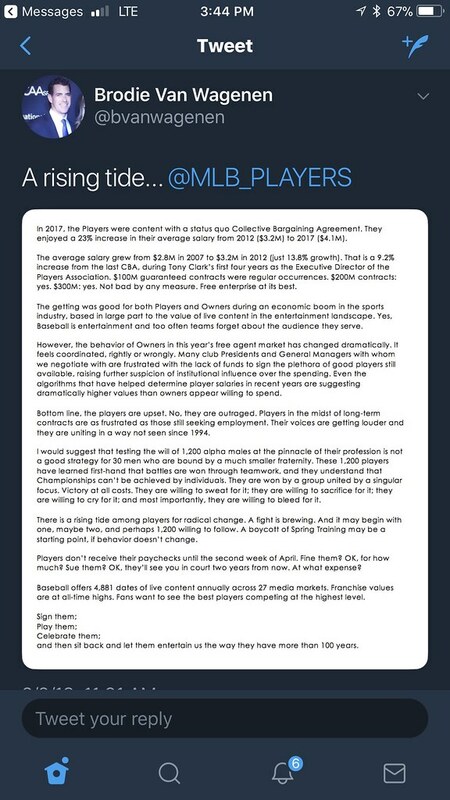 How about this Free agent class isn’t strong and no one wants to pay outrageous money for “good” players when they can pay outrageous money for better to elite players next year? “No, the players won’t be boycotting spring training, the Players Association clarified in a statement, refuting the words of its own star agent Brodie Van Wagenen.